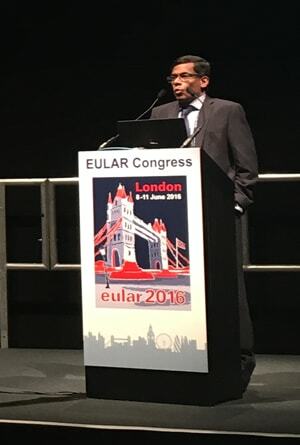 Dr A Moorthy is a consultant Rheumatologist and a Hon Senior Lecturer at a busy teaching hospital University Hospitals of Leicester NHS trust. He runs Specialist Back pain clinic/ Ankylosing spondylitis clinics at Leicester Royal Infirmary with MDT input by Physiotherapist. Dr Moorthy also runs NHS clinics at Leicester General Hospital, and Loughborough Community Hospitals. Dr Moorthy is the lead clinician for Ankylosing spondylitis and Ultrasound service in Rheumatology. Dr Moorthy sees private patients by prior appointment at Spire Leicester Hospital, Nuffield Leicester Hospital, Spire Nottingham Hospital and Woodland Hospital, Kettering, Northamptonshire. Pain in the lower back (lumbago) is common, although it can be felt anywhere – from the neck to the hips. A form of arthritis characterised by severe pain, redness and tenderness in joints. An inflammatory disease caused when the immune system attacks its own tissues. Fibromyalgia is a long-term or chronic disorder. It is associated with widespread muscle pain. Shoulder pain is a common problem with a number of different causes. It's often a symptom of another problem. Ankylosing spondylitis (AS) is a long-term (chronic) condition affecting the spine and large joints. A condition in which some areas of the body feel numb and cool in certain circumstances. A numbness and tingling in the hand and arm caused by a pinched nerve in the wrist. Neck pain or a stiff neck is a common problem which usually gets better after a few days or weeks. A chronic inflammatory disorder affecting many joints, including those in the hands and feet. A condition in which the tissue connecting muscle to bone becomes inflamed. Dr Moorthy has always been professional and available. He has always helped me to adapt to my personal situation. He was Very nice, put my mind at ease re my condition. Answered all my queries. He was polite, knowledgeable and very helpful. He listened intently to the issues at hand and made quick judgements. I received good feedback on my problem and fast solutions to follow up procedures.